The death of Norman Buwalda, the Southwold resident who was mauled by his pet tiger earlier this year, is the kind of tragedy that may be prevented in the future under a private member's bill introduced in the Ontario Legislature by Brant Liberal MPP Dave Levac. If passed, the Exotic Wildlife in Captivity Act would regulate the ownership and acquisition of exotic animals and require anyone wanting to own wildlife to apply for a licence through the Ministry of Natural Resources (MNR). "David Levac's bill is giving us an opportunity to make things right, for the safety of Ontarians and the animals involved," said Melissa Matlow, programs officer for the World Society for the Protection of Animals Canada. Buwalda was known to have zoo-quality containment for his cats, but neighbours complained he let the cats roam free and he entered their cages. One of Buwalda's cats attacked a 10-year-old Toronto boy in June, 2004. At he time, his injuries were said to be serious but not life-threatening. The incident caused an uproar and Southwold attempted to ban exotic pet ownership. A court quashed the township's bylaw and Buwalda was able to keep his two tigers, two lions and cougar. The outcome pleased Buwalda, who cared dearly for his animals. "Mr. Buwalda took great care of his animals. This wasn't a roadside zoo," London lawyer Alan Patton said at the time. Buwalda died Jan. 9, 2010, after he was attacked, it is believed, while feeding a tiger. Under the proposed legislation, the licence would require owners to provide the animals with suitable housing and care based on the needs of the animal, keep the public safe from danger and surrender the animals to the MNR should they fail in any of these duties. "There needs to be a proactive licence to show that the owner is capable of taking care of their exotic animal," said Matlow. 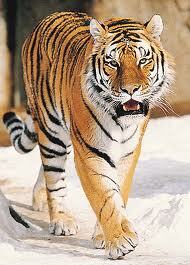 Present owners of exotic animals would be made aware of the bill and what is expected of them. They would not have their pets taken away if they do not get the licence but they will not be able to breed new ones. Ontario is the only province that does not require a licence to keep dangerous exotic animals, and an estimated 500 exotic cats, such as lions and tigers, are kept as pets in the province. "Ontario is the only province that allows anyone to keep exotic animals like tigers in their back yard without a licence," Matlow said. "This is a serious animal-welfare and public-safety problem and Ontarians overwhelmingly support action to address it. The bill will restrict ownership of dangerous exotic wildlife to professional zoos and set limits on exactly who can keep exotic wild animals in captivity and under what conditions." Nathan Casselman is a St. Joseph's High School student on co-op placement in the Times-Journal newsroom.